Living here in the Lowcountry automatically increases your risk of overexposure to the sun’s damaging rays. Maybe you weren’t planning to be outdoors for long as you were, or you didn’t use adequate protection; or maybe you were fooled by thinking you wouldn’t burn on a cloudy day. As much as 90 percent of UV rays pass through clouds, burning your skin as severely as direct sunlight. And while the sun does offer some benefits, such as vitamin D, excessive sun exposure, especially sunburn, can be damaging. Not only does sun exposure increase the appearance of aging, it is now known to be a major risk factor in the development of skin cancer. So what can you do to protect your skin? Avoid unnecessary sun exposure by using reasonable sun protection, including sunscreen and protective clothing. Many people do not realize that solar radiation adds up over your lifetime. None of it goes away. And while prevention is always the best course of action, there are several things that can be done to help reverse some of the sun’s damage. Laser treatments, such as Fraxel (as seen on The Today Show and Oprah ) can improve the appearance of sun damage and offer smoother, fresher, younger-looking skin, reduced wrinkles around the eyes and overall improved skin tone and texture. This type of laser treatment works through thousands of microscopic laser columns—each just one-tenth the diameter of a hair follicle. The laser columns stimulate a natural healing process that works from the inside out, replacing damaged tissue with younger, smoother, healthier skin. 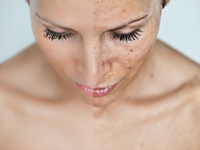 Fraxel treatments vary in aggressiveness, downtime, and number of procedures needed, based on desired results and the severity of the sun damage. Also popular are fillers, peels and injectables. Peels are procedures that remove the upper parts of the skin allowing recovery and re-growth of the surface. This relies on initially wounding the skin which stimulates growth of fresher, newer-looking skin. The peels can either be superficial or quite deep into the dermis. Skin fillers can be used for individuals with deep lines and wrinkles. Injectables, such as Botox do not change the quality of sun-damaged skin and are recommended for individuals with wrinkling in the forehead (frown lines) or crow’s feet; however, these wrinkles are not the result of sun damage. Not only can the sun be damaging to your face, but to your eyes. Sunglasses provide one of the best sources of UV protection. In order to properly protect your eyes, choose sunglasses that offer at least 95 percent UV protection. Also, choose a lens tint that blocks 80 percent of transmissible light, but no more than 90-92 percent of light, because lens tint does not protect you from UV rays, and can affect your ability to see correctly. Large lenses that fit close to the eyes are best. Those that block visible blue light are even safer. Brimmed hats can also offer protection. And don’t forget about protecting your hands. Unless you always wear gloves, your hands receive a tremendous amount of sun exposure over time. Wrinkles, brown spots and leathery skin are caused by the sun’s ultraviolet (UV) radiation. Always include your hands in your sunscreen applications. If you notice anything unusual on your skin, you should schedule an appointment right away with a dermatologist to be screened for skin cancer. Since early detection greatly improves the chances of surviving melanoma, you should examine your own skin every six to eight weeks. The best time to do this is after a bath or shower, standing in front of a full-length mirror. Use a hand-held mirror to help you view areas that are difficult to see. Examine all moles or markings and look for any changes in the number, size, shape or color of these markings. Melanoma can appear suddenly as a new mole or it can develop slowly in or near an existing mole. In men, melanomas are often found on the torso or the head and neck area. In women, melanoma often develops on the lower legs as well as on the torso. The Lowcountry offers us a wonderful array of outdoor lifestyles: the beaches, the pools, the golf courses, the tennis courts and the joys of gardening. Enjoy it all, but use protection. Apply sunscreen daily.